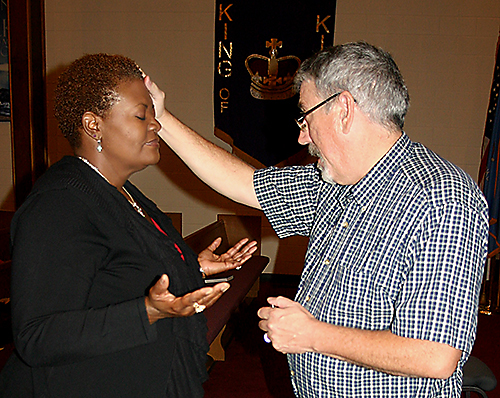 Chuck Horton, right, uses oil to anoint Faye Perry, pastoral care minister at OKC-Sunny Lane. 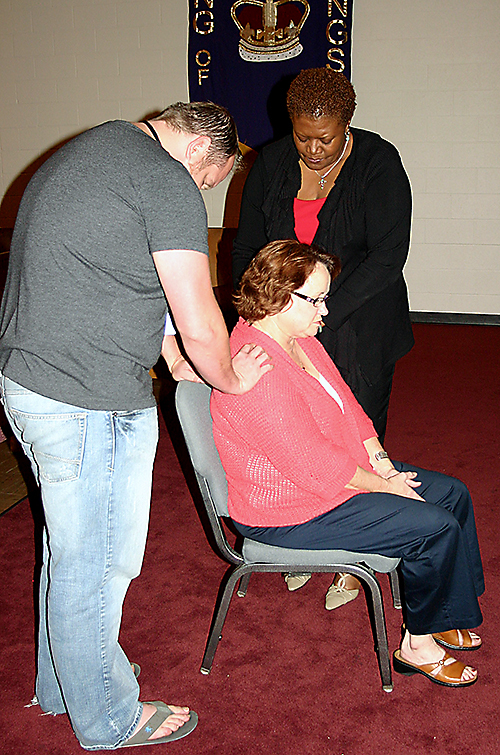 Sunny Lane’s youth pastor, Jonathon Cline Smith, left, and Faye Perry encircle Kathy Bray and pray with her. Their ministry was part of a special healing service on 9/11. A recent Sunday night service at Sunny Lane United Methodist Church in Del City might have looked a little unfamiliar to longtime Methodists. People filed toward the front of the sanctuary, where their foreheads were anointed with oil. Ministers and prayer-team members stood ready to pray with them for healing. The service was drawn from a lesser-known section of The United Methodist Book of Worship, said Chuck Horton, superintendent of Lawton District. He and his wife, Nancy, led the special day dedicated to healing prayer at Sunny Lane. "A lot of pastors may not even be aware that service is available," Rev. Horton said. Prayers for healing and wholeness set the theme for the day (Sept. 11) at the church, including the morning services, Sunday School, and an afternoon workshop for people who are part of the church’s prayer team. The workshop, "Introduction to Healing Prayer," was presented by Nancy, a registered nurse who has a personal ministry of healing prayer. The workshop addressed how to conduct prayer for healing physical, spiritual, or emotional wounds. The special day was intended to sharpen the congregation’s focus on prayer. "Let’s do more praying in the church for one another and for the world," Sunny Lane Pastor Larry Bauman said during the service. Horton based his evening sermon on Acts 3:1-16, the story of the lame beggar who was healed after an encounter with Peter and John. It’s "probably the most important healing story in the whole Bible," Horton said. "Jesus is gone … the mantle passes from Jesus to the Church. The Church has now taken over the ministries that Jesus had been doing." The service, a condensed version of the one in the Book of Worship, included Communion. Rev. Bauman chose to shorten it to dedicate more time for prayer. During that prayer time, worshippers lined up to move toward the chancel area. One by one, they quietly shared their healing needs with Bauman or Horton, who anointed them and prayed with them. Those who wished to connect with members of the prayer team moved to sit in chairs facing the altar. Team members stood beside each person, placing comforting hands on the person’s shoulder and bowing their heads. Healing prayer is not that different from the style of praying that people are familiar with in church, Horton said. "To me, prayer is prayer." Bauman said Sunny Lane UMC has begun to offer such services periodically. Also, the church’s Care Team and prayer team members are available after regular services to pray in the church chapel with people who desire it. Sunny Lane decided to start this ministry "so we would have some people to pray with people needing prayer after our services," said Bauman, in his fourth year as pastor. Some people feel self-conscious about requesting prayer during a regular service’s "cares and concerns" time, Horton and Bauman agreed. There is an individual-care aspect to healing prayer, Horton said. "It’s just probably more about a specific need in somebody’s life than what might happen on a Sunday morning." Healing, when it occurs, might not be dramatic or obvious to others, Horton said. "There are all kinds of healing in our lives." Some occurs only gradually. In some cases, a person "may begin to recognize that God loves them, that they’re able to make peace with someone" after healing prayer. "To me, that’s all healing." Certainly, the healing is not as theatrical as the types of healing depicted in the movies, he said. Horton has visited about 10 churches to discuss ways of introducing this ministry. A Missouri church holds a healing prayer service weekly, he said.